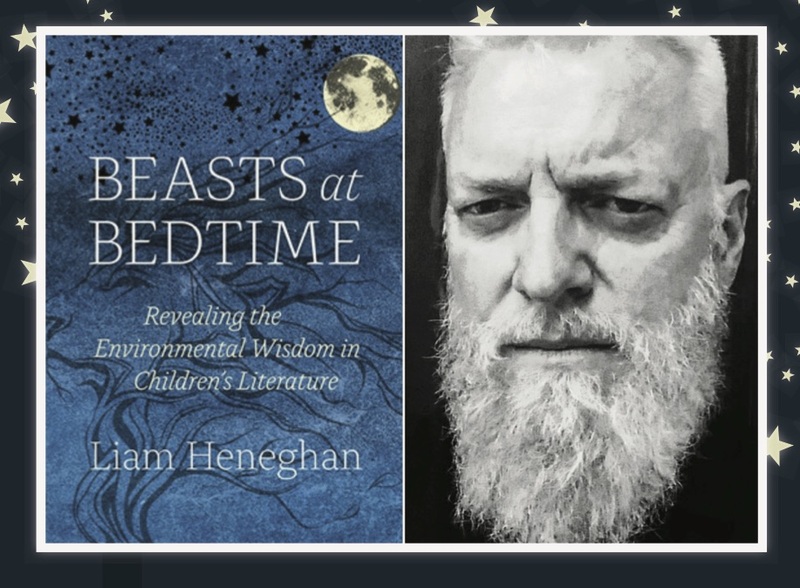 Liam Heneghan’s Beasts at Bedtime: Revealing the Environmental Wisdom in Children’s Literature conjures a world of natural magic and wonder. Animals are more than animals, trees are more than trees, the moon and the stars draw close, and they are all mysteriously intertwined. 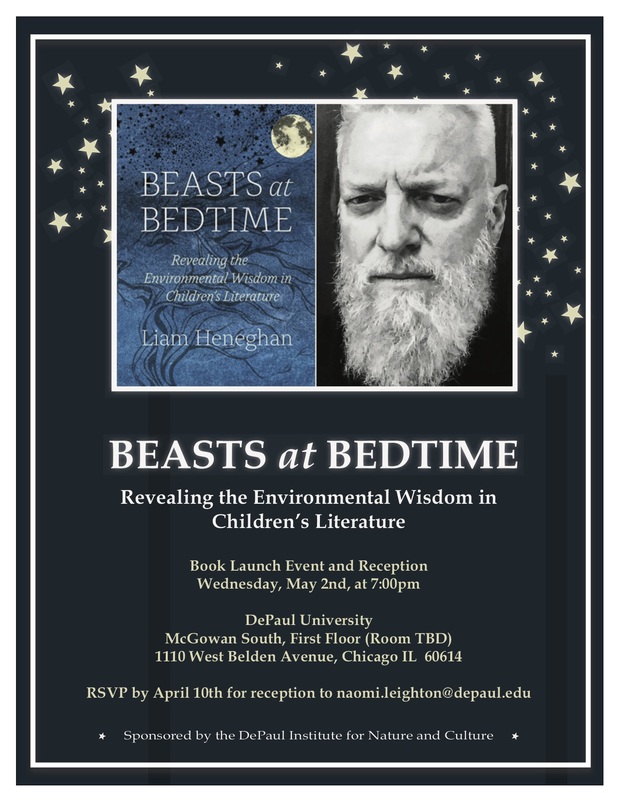 This marvelous book is an introduction to environmental themes in children’s literature as well as a model of literary criticism accessible to a broad audience—because it must be. Such work must be accessible, because environmental issues are so critical and the need for increased environmental literacy so urgent. The genius of the work, however, is Heneghan’s ability to speak from a wide variety of experiences and perspectives with one exceptionally lively, congenial, and coherent voice. On the surface we encounter a scientist, teacher, and father; but in the depths we see flashes of a child, animal, and sprite. RSVP for reception so we can order enough food. However, everyone is welcome to attend the event, whether or not they RSVP. Jeff VanderMeer’s new novella, The Strange Bird, is ingenious, provocative, and deeply moving. At times, it’s almost too painful and too beautiful. As a Borne story, it’s also revelation. Out of the futuristic world of Borne, VanderMeer conjures a totem for the Anthropocene. A hybrid spirit strange and familiar enough to wake us from our dogmatic stupor, Strange Bird guides us into unexplored regions of literature and the psyche. While we have excluded the secret life of animals from consciousness, on some level we understand their suffering because we suffer together. Nested in Borne, adjacent to VanderMeer’s Southern Reach Trilogy, The Strange Bird brings us to the intersection of animals and the Anthropocene. We’ve been here all along, but now, slowly, we’re becoming aware. Twentieth-century techno science created a false dichotomy of lab animals and animals in the wild. Born and bred to serve the medical and biotech industries, lab animals were primarily studied as surrogates for human bodies. Knowing them was generally synonymous with killing them, and always dependent on removing them from their natural environment and social context. This resulted in a culture that “understood” animals in isolation, and through the mottled lens of human interests narrowly conceived. Wild animals were occasionally observed in the wild, during the last American century, but more often on television programing about animals in the wild. Mass media creatures were smart, charming, dramatic, and often hilarious. Masterfully edited, as well as narrated and set to music, such representations were a form of domestication or at least spectacle, related to zoos, aquariums and circuses. The most commonplace animals of the Modern era, however, were agricultural animals, not so much on farms, or even stories about farms, but at breakfast, lunch, and dinner. These animals didn’t have behaviors. They were invisible. Enter The Strange Bird. VanderMeer’s novella is as much urban odyssey as fantasy. At the beginning of the narrative Strange Bird, a biotech marvel, escapes the confines of a lab. In flight, she navigates an unfamiliar and frightening world, and begins to understand herself in new contexts and from different perspectives. Before long she is captured by a solitary old man who admires her, but who also imprisons her. He is attached and attentive, seems to want to commune with her, but he can’t appreciate her suffering. Like other humans in the novella, he rationalizes his cruelty even as he is haunted by it. Eventually Strange Bird lands squarely into the narrative of Borne, where she is captured by The Magician, a sadistic genius who transforms her into a cloaking device. Somehow Strange Bird survives the radical transformation and enters a kind of bardo, where she communes with other animals, alive and dead. Throughout the novella Strange Bird appears lost and alone. The cage is no home for her, but neither is the world. She is oriented to the voice of a friend or relative (intimate, stranger, and enemy), very close to her but also far away. Told from the point of view of a hybrid, engineered animal, The Strange Bird is one of VanderMeer’s most psychologically complex and heart-rending narratives. How does VanderMeer create and draw us into the inner life of Strange Bird? Part of the answer must lie in his equally well-wrought and unapologetic anthropomorphism. As VanderMeer has explained in interviews and essays, the intellectual prohibition against anthropomorphism has prevented us from speculating about animal experience. [ii] But this stance betrays Modern prejudices. At a time when the popular media assertively preach the virtues of compassion (identification with the feelings of other human beings), we are reluctant to consider the thoughts and feelings of animals because we have already concluded they are categorically different. Even imagining what animals could be feeling is considered naïve, as if early twentieth-century phenomenology and Psych 101 behaviorism were articles of faith. Anticipating such objections, VanderMeer engineers human consciousness into his main character, though he also flirts with cross-species communication throughout. Defending the speculative/creative impulse, I stubbornly note that human beings in all cultures still strive to understand one another every day. We dream of sympathy. We recognize ourselves in others. Sometimes, it seems, others understand us better than we understand ourselves. This counterargument has become a critical cliché, but it is also our way of life—our culture. Even if our sense of understanding and being understood are fabulations, why should we be dissuaded from striving to understand animals in this fashion? And why have we forgotten that this prohibition is a cultural and historical anomaly? The long-standing, cross-cultural tendency to anthropomorphize is arguably a product of various and obvious similarities between human beings and animals. This is not only true from a biological perspective but also an ecological one. We share the same home. We are nurtured by the same planet. I’d like to suggest that the leitmotif of habitat or home is a primary reason that VanderMeer’s novella is so moving. In The Strange Bird we can identify with the circumstances of the animal. If the storyteller is in a type of relation to the animal, he or she can help us imagine the creature’s circumstances, but perhaps that bond begins and ends with sharing a home. Like so many of VanderMeer’s characters, Strange Bird is traumatized. There are known and unknown causes of her trauma. Her inner life is familiar, strange, and mysterious, but readers can generally understand the experience of being imprisoned, for example. Though we may not be traumatized by such experiences, we have all had our freedom restricted, and we have all suffered as a consequence. Even if we ascent to such restrictions, through written, spoken, and unspoken contracts, we feel the tension between our competing desires for connection and autonomy. Being conflicted, torn, fractured, and broken, are other common, potentially traumatic experiences. Particularly disturbing and provoking are VanderMeer’s first-person accounts of dismemberment. As Strange Bird is confined, tormented, and exploited by the Magician, we could and should reflect on basic bodily and psychological autonomy. How do we recognize and fail to recognize bodies in different circumstances? All sorts of relationships, perhaps even the imperatives of survival, tear us apart physically and psychologically. All animals are effectively dismembered when their bodies and brains are exploited. Even love tears us apart. To what extent, and why do we ascent to or resist various transgressions? Most conspicuous about the main character and the story, is the fact that Strange Bird is always alone. We notice this first when she encounters other birds in social configurations. Later she begins to communicate with “the little foxes.” This is a kind of solace for her, but also serves to foreground her physical isolation. When Strange Bird enters the narrative of Borne, she enters a second storyscape of alienation. She continues to commune with various creatures, in more or less out-of-body experiences, but Rachel and Wick are the only humans who show her kindness, who care for her. We know from the example of the Passenger Pigeon that life and survival are intimately related to community. [iii] We also know that many animals need wide ranges in order to thrive even as individuals. All animals need space as well as society. Perhaps more significantly, each animal defines space in its own fashion. In this sense, human beings may not easily understand non-human behavior, though this may be a result of limited interaction rather than essential incapacity. As a Borne story, The Strange Bird is a creative but earnest speculation about animal behavior in the Anthropocene. As such it’s also a story about animal trauma. It seems reasonable to speculate that animal trauma, in general, is connected to environmental degradation, survival pressures, displacement, and violence. We understand, and often repeat, the poorest populations are most affected by climate change, but we don’t generally include animals in this equation. What does all this mean for The Strange Bird as a new literary work by a prominent contemporary writer? I’m reminded of Amitav Ghosh’s imperative that literature in the Anthropocene should not be fantastic, because it masks real climate-change related horrors. [vii] This may be a legitimate critique of popular dystopian fantasy, but the criticism makes less sense in the context of surrealism (qua surrealism), VanderMeer’s chief mode. Remembering that surrealism, historically, was an attempt to capture a more complete reality (a form of psychological realism), we can appreciate contemporary surrealistic literature as an attempt to include psychological strata that have been systematically excluded from realistic representations. [viii] Enter the unconscious. Unconscious communication has been the purview of writers for well over a century. But all the arts engage the unconscious—consciously and unconsciously. Aesthetics might even be described as a paradigmatic unconscious value system. And while art, like language, is generally considered a uniquely human enterprise, we also know that many animals, birds in particular, sing and dance to attract mates. How is this essentially different than the conscious and unconscious behavior of human “peacocks”? In the context of Borne, The Strange Bird traces the terrible beauty of animal trauma in the Anthropocene, not as a surrogate for human trauma, but as a creaturely condition that directs our attention to the ubiquitous effects of climate change. If trauma can be communicated through non-verbal behavior, it may be an appeal to all animals. Artists like VanderMeer seem to hear that call, but are they uniquely aware of animal suffering, or uniquely responsive? I imagine that many of us are more aware of our collective suffering than we know. VanderMeer may not speak for non-human animals, but he surely gives voice to the unconscious. [ii] See “Moving Past the Illusion of Control,” above, as well as this Gulf Coast magazine interview on Borne. [iii] The species became extinct because individuals can only mate in large flocks. See this Smithsonian Encyclopedia entry. [v] See Rob Nixon’s Slow Violence and the Environmentalism of the Poor and VanderMeer’s comments on war and ecological degradation in his Environmental Critique article on Johannes Heldén’s Astroecology published here. [vi] Read VanderMeer’s Finch, as well as his other Ambergris books, City of Saints and Madmen and Shriek: And Afterword. [vii] See “Amitav Gosh: where is the fiction about climate change?” in The Guardian. [viii] See this Met summary of surrealism. [ix] The revival of the unconscious by the neurosciences and the influence of affect on cognition have become common knowledge in academic discourse. An interesting recent book on these topics is Richard Nisbett’s Mindware: Tools for Smart Thinking. In a recent conversation, VanderMeer noted that we anthropomorphize animals in various sorts of propaganda, and I wonder if this is a marker of (social) media aesthetics as an unconscious economy. [x] See this short Cambridge article on unconscious language learning, and this Princeton piece on body language and intense emotions. Jeff Vandermeer is sometimes credited with creating a new genre of ecological fiction with his Southern Reach trilogy, and the startling “Area X” which functions as the scene, action, and main character of the novels. VanderMeer doesn’t like the moniker “cli-fi,” however, and his academic readers, at the very least, can appreciate why “climate change” doesn’t account for his work. Certainly ecological change is one of the main topics of the trilogy: Area X is generally interpreted as a territory in which ecological degradation is mysteriously reversed, with terrifying consequences for humanity. But VanderMeer’s vision is broader than climate change, and this breadth of vision might begin to account for the brilliant “weirdness” of his novels. In a published conversation with critical theorist and philosopher Timothy Morton, published in Paradoxa (volume 28), VanderMeer commented that contemporary realistic fiction which somehow manages or contains climate change within given, classical forms isn’t very realistic. Mere climate fiction, conversely, may focus on the environment while forgetting the complexities of context writ large. The ecological context is most obvious in VanderMeer’s work, but sustained critical attention to environmental issues may have distracted readers from socio-cultural themes, as well as the vulnerable bodies and fragile psyches of his characters. VanderMeer’s work began to be associated with Tim Morton, Hyperobjects, and the Anthropocene, with the publication of the Southern Reach trilogy, in 2014, and more recently with Morton’s new book, Dark Ecology. Morton is also known as a proponent of Object-Oriented Ontology (OOO), a popular philosophical mode of inquiry associated with Speculative Realism. OOO is also very interested in the uncanny and the weird. Graham Harman’s Weird Realism: Lovecraft and Philosophy meticulously illustrates the relationship between object-oriented ontology and the weird, for example, and VanderMeer could easily substitute for Lovecraft in that work, and probably should. But this association with Speculative Realism may be limited and limiting. Though I believe it to be theoretically broad-minded, agile, and pragmatic, Speculative Realism has come to be associated, in the public sphere, with merely philosophy speculation. And though the relationship between VanderMeer and the Anthropocene, within the context of Morton’s work, has been and will, no doubt, continue to be very productive, critical commentary focusing on ecological issues, as we currently understand them, in VanderMeer’s corpus, may have the same limitations as literature which tries to contain climate change within classical literary forms. Of course the Southern Reach is about the environment, but also, more accurately, about relationships among the environment, institutions, bodies, and minds. The Company itself seems to have come from elsewhere; perhaps it is (as the novel suggests at one point) a mechanism of “the future exploiting the past, or the past exploiting the future,” or “another version of Earth” enriching itself at the expense of this one. (The issue is not resolved, but I find it suggestive: it’s a far better version of Nick Land’s fantasy of capital as an alien parasite from the future). (The idea of the future exploiting its own past — which is our present — is one that I find especially compelling; something like this is also the premise of Grant Morrison’s Seven Soldiers). Shaviro’s concept of “the future exploiting the past or the past exploiting the future” is particularly apt, at this moment, as the American fossil fuel oligarchy guarantees its “right” to extract as much wealth as possible from long-buried resources, at the obvious expense of current and future generations. But the concept is also generally true, and no one can escape the hyperobject of capital. While accelerationists are often criticized as dystopian, anarchic, and even malicious, the “outside” stance of some environmental ideologues subtly undermines their own convictions of interconnectedness. VanderMeer’s work, including his soon to be released Borne, describes a much more intimate and complicit relationship to capital. There’s no “outside” to the meta-ecology of nature and capital in Borne, and none in the “real” world. Most of us occupy a liminal space, vulnerable to the influence and seductions of capital, even as we may deny our responsibility, and this self-deception may, in fact, be structurally necessary. The novel has been described as the genre of the Modern human subject, which appeared, with capitalism, on the cultural scene in the Eighteenth and Nineteenth Centuries. Twentieth-century literature often described human subjects in existential crises, for obvious reasons, as did the “weird” Kafka, for example, and postmodern/posthuman fiction is characterized by the dissolution of the human subject as we know it. Alison Sperling’s article in Paradoxa (28), which features the conversation between VanderMeer and Morton, draws attention to the porous body in the Southern Reach trilogy, and the body as a major theme in VanderMeer’s work. Sperling reminds us that human bodies are neither inside nor outside of the space of ecological degradation. The weirdness and threat of Area X in the Southern Reach constitutes a direct biological threat to human beings, even though the strangeness is atmospheric. When the biologist is infected with an alien spore, the contamination significantly occurs without direct contact. The atmosphere is the medium. This moment illustrates that Anthropocene bodies are vulnerable because they are non-separate from their environment. Sperling also makes the extremely astute argument that environmental threats may be complex and unmanageable, because the environment too is sick from multiple causes, related to complex human intervention. Thus the “weird” conceit, throughout VanderMeer’s work, that bodies are invaded but also became part of other organisms and/or organic systems, may “realistically” reflect current ecological conditions. But these incursions and transformations are not limited to bodies. VanderMeer’s charcters are not merely bodily hybrids, but also psychological hybrids. As each character is contaminated they change psychologically. The introduction to Paradoxa (28) reminds us of the origins of the uncanny in Freudian psychology, and the requisite condition of uncertainty. (Freud notes that fairytales are not uncanny, for example, because they have almost no connection to reality.) Uncertainty is only remarkable within a generally predictable, certain, context. And we find uncertainty on various levels of the Southern Reach trilogy, within various levels of “reality.” As Area X is a mysterious space within a realistic setting, the characters’ psychological “symptoms” manifest within functioning psyches and more or less conventional institutional cultures. Among the most memorable psychological moments in the Southern Reach trilogy are the initial contamination of the biologist which she seems to interfere with her perceptions; Control’s darkly humorous resistance to hypnosis by screaming obscenities at his superior over the phone; and the rapturous madness of Whitby. But most intriguing is the problem of origins. Does the madness of Area X originate with an alien invasion, institutional attempts to control the invasion, human frailty, or some combination of the above? Is it a form of original sin? Is it a weapon of the invasion, collateral damage, or something else entirely? In “Character Degree Zero: Space and the Posthuman Subject,” the first chapter of Science Fiction Beyond Borders (2016), Elana Gomel argues that the posthuman characters of contemporary science fiction are affectively “flat” because their psyches are somehow extended into the environment, rather than contained within their bodies. [i] In lieu of the pathetic fallacy of traditional fiction, in which the natural environment metaphorically reflects the internal psychological states of the characters (but remains essentially separate), contemporary science fiction is often marked by “character eversion,” a novel state in which a character’s psyche escapes the body. Eversion is also an inversion of space and character. Rather than focusing on round characters in flat worlds, posthuman science fiction presents flat characters in round worlds (6). The affective flatness of Southern Reach characters could also be interpreted as a symptom of trauma or disassociation. Like ecology and culture, trauma may be our habitat. VanderMeer has speculated that the Gulf Oil Spill entered his psyche and became the tunnel/tower at the heart of Area X. This makes sense in the context of Gomel’s thesis. Though trauma may originate outside of the psyche and breach its barriers, it must also be externalized, because it’s categorically too big to be contained. The fusion between place and character in SF can also be seen politically, as an expression of the emerging eco-consciousness. Character eversion generates subjects who give up the temporal coherence of the liberal-humanist self in favour of a more capacious and inclusive sense of belonging. They lose themselves but gain the world. This discourse is no longer adequate either narratively or politically. The “everted” characters, fading into the alien landscape, offer a revolutionary, if unsettling, view of the possibilities of interaction between humans and other living creatures: surely an important subject in the Anthropocene age. The sum of these critical reflections points to a broader, forward-looking ecology in VanderMeer’s work, a whole far greater than the sum of nature, consumer-capitalism, body politics, and even posthuman notions of the psyche. This bigger, emergent “thing” is not quite organic, artificial, animal, or machine, but something novel and challenging, demanding novel, challenging responses . . . which brings be back to VanderMeer’s ideas on realism and form. Realism to date has been unapologetically anthropocentric. What would a non-anthropocentric realism look like? Visionary, uncertain, dream-like? Hard-edged, crushing, hyperreal? As the boundaries between human beings and their environment begin to dissolve, epistemologically, realism may become impossible, or at least very quaint. A kind of nostalgic, historical mode . . . leaving us with pure experience. [i] Gomel vacillates between flat as one dimensional and flat affect. In this piece I’m referring to the latter sense of the word. Borne has been described as one of the most anticipated novels of 2017, following the success of VanderMeer’s New York Times best-selling and critically acclaimed Southern Reach trilogy. The first novel of the trilogy, Annihilation, also attracted the attention of Paramount and Alex Garland, writer and director of the superb 2014 film, Ex Machina. Annihilation, the film, currently in post-production, is scheduled to be released before the end of the year. But neither of these feats seem as remarkable, to me, as VanderMeer’s ability to captivate and hold the attention of an academic audience, particular those in the Humanities who collectively hold writers to a standard set by well over 300 years of literary fiction in the modern languages. On its surface Borne seems like a relatively simple tale, certainly compared to the multi-faceted, deep-mapped narratives of the Southern Reach and, even more so, VanderMeer’s astonishing, and astonishingly underappreciated Ambergris series. But once you begin to examine Borne more closely, once you begin to unfold its surface layers, you may discover, in addition to a moving story, a series of meditations on age-old topics of being and becoming . . . the relationship of parts and wholes, biological growth, the development of a psyche, and the relationship of creatures to their natural environment, to name a few. Borne is patently about parts and wholes. The population scavanges, salvages, tinkers, and trades in a chaotic array of very strange biotech. DIY meets dystopian science fiction/fantasy, but this is no dark green fantasy camp. “Human” actors are not just tinkerers; they are also tinkered with. Everyone is technically improved—more or less. This state of affairs generates unusual tension in relationships; considerable anxiety about wholeness, completeness, and authenticity; and almost compulsive soul searching. I am not what I seem . . . something’s missing . . . how did I get here . . . what is wrong with you . . . this doesn’t add up . . . did you see where I left my soul? In the broken city, a diverse population of hybrids survives on biotechnical scrap. The more human creatures find distraction in the usual dystopian pursuits of drugs and violence. And while the main characters, understandably misanthropic, retreat into a dark cave, they also remain complicit in the Company’s boundless abuse, and categorically ashamed. Though literary fiction should neither serve nor accommodate philosophy, Borne’s sustained focus on the problem of parts and wholes, at various scales, reminds us of classical and contemporary problems of mereology (the study of parts and wholes). VanderMeer’s appeal to Speculative Realism, and virtual dialogue with Timothy Morton and some of the major topics of Object-Oriented Ontology, furthermore, remind us of the very long relationship between mereology and ontology (the study of being). We create monsters out of parts, for example, but recognize them as such, perhaps, because of our intractably provincial sense of integrity. Borne, the creature, might be described as an example of technologically accelerated evolution folding in on itself. He moves from sea anemone to plant to animal to person to leviathan, and then somehow evolves into a giant, single-celled creature, before returning to his original state. Because Borne is continually changing shape and because the direction of his development is so unpredictable, he ultimately seems to occupy all points at once. Is he born or programmed to be everything at once? Is he some kind of super-complex, living hypercube? Or is he a really big mistake? But biotech is more correctly about animals and machines. [iv] And indeed, animals are folded into machines and machines into animals on every level of the work. Most of the hybrids in the novel seem more animal-like—enhanced animals rather than enhanced machines—but perhaps we just don’t see the machine (so much) because we are vitalists (as well as speciests), conditioned to privilege familiar forms over unseen functions. A recent revival of academic interest in vitalism, from Henri Bergson to Brian Massumi, seems to point to the wisdom and virtue of “real life,” in response to, or possibly in reaction to, various AI turns. AI is generally a frustrating discourse, for outsiders, but the playful yet philosophically earnest, and extremely insightful, speculations of Ian Bogost’s Alien Phenomenology, or What It’s Like to be a Thing remind us that operating systems can be endlessly fascinating, and even charismatic, once you get to know them. The overarching soft-tech, wet-ware bias of the novel seems consistent with VanderMeer’s Ambergris sensibilities, but thinking about cultural distinctions between nature and technology is inherent in all of his recent works. At what point, precisely, do simple tools become machines? What was forged in the iron age? What snaked in and out of the age of information? And why are we turning away from both at this point in time, going back to “nature” and “life,” so much so we don’t even question the value of the turn, even as we are more, and more intimately, bound up with and bound by technology? In some ways Borne, the character, doesn’t evolve very much at all, and this might be an indication of his limitations as a hybrid. What machine, part or whole, could match the fathomless history of life? While many readers will undoubtedly become attached to Borne as a child-like figure, sacrificial lamb, and/or distant relation of Southern Reach’s Crawler, Borne remains, for the most part, an empty, inverted vessel. He can take on any form and contain multitudes because, in his absurd versatility, he remains formless and empty. He’s not really up to the task of a relationship with anyone, though there is a moment . . . of heartbreak. For some reason (it was sudden and surprising for me), we feel Rachel’s love for Borne most keenly when she is forced to abandon him. She can’t bear to leave him, but he can’t evolve beyond his monstrous impulses, though he clearly wishes he could. Grow up. Stop acting like a two-year-old. But two-year-olds don’t have regrets, and neither do machines. In the end, Borne, becomes a misfit among misfits, but also a hero, and a sacrifice. And in this sense human. Mord is a colossal menace form the start, and seems much less complicated, but he’s also a sleeper. Once you get past the frenzy of trying to make sense of him . . . once you overcome the compulsion to put him back into the author’s psyche to understand how he was conceived and nurtured, you might discover you actually like him. Compared to Borne, Mord has too much substance, but there’s something charismatic about his matted mass. He’s solid, genuine, unapologetic . . . even sincere. You always know where you stand with him. You know he could and would stomp you, given the chance, and you know that he should. No ethical prevarication. At the same time Mord also presents a conceptual riddle. He’s a bear—grumpy, willful, wild, and out of control. He eats and sleeps a lot, has really bad breath, and mostly bad hair days. Like Borne, biology seems to be his dominant trait. However, he doesn’t seem to have emotions (except for an undifferentiated rage, hardly recognizable as feeling). And his mode of flight, makes no sense whatsoever in an animal world. As a flying bear, Mord is categorically mechanical, and yet barely “real.” Without the Company, it seems, he would have no reason to exist. Without their avarice, manic sense of proportion, epic resource grab, and complete lack of accountability, he would not have left the drawing board. Truly, Wick’s discarded fish, even a giant walking fish—sitting on the porch drinking lemonade—beats a flying bear, every time. I remain anxious about VanderMeer’s freedom, but admit there’s ultimately something compelling about the combination of the mammoth animal and enormous machine in Mord. Biotech at this scale becomes a difference in kind. A different kind of biotech. A different kind of novel. A different world. The jump in scale from minnows to Mord, in Borne, invites us to first notice, then see, and subsequently reflect on the still larger, ecological scales of biotech in the novel. Not only Borne but Borne’s world is a biotechnological monstrosity. Biotechnical creatures, great and small, cannot be contained in a lab, inside a built environment, or outside of an ecological space. And biotech weapons certainly can’t be contained. Anything created in a lab is already part of the environment. There’s no inside and no outside. And before you know it, you have a toxic biological and cultural soup that can only evolve toxic creatures. So there’s a lot more than biotech, as we know it, being folded in this dystopian laundry. There are ecological folds—water, chemicals, soil, and vegetation in unsustainable proportions. Geological folds in the salient caverns and crevices. Institutional folds within the Company. Folds in time and space, in worlds within the novel, intertertextual folds. And ecology is folded into geology, and into the ruins of culture. Time and space are folded into characters, worlds, and texts. Vandermeer’s brain, folded back on itself, unfolds freely in the text, and we too are brought into the fold. We open each drawer of this ornate cabinet, curious, reckless, guilty, but also compelled. Unfold a letter addressed to someone else, and watch incredulously, as the cyphers themselves begin to unfold. I am not what I seem, but I made you whole. You are not what you seem. Do not forget. We can outrun them. Borne’s different scales of biotech, and stretches of the imagination may challenge fans of VanderMeer’s weird realist, Southern Reach Trilogy. One might worry that VanderMeer has wandered from his post as a virtuoso world-maker and painstaking literary craftsman. One might worry . . . if one had become too attached to the diamond-tough characters, dazzling descriptive passages, and old-world pacing of his Southern Reach and Ambergris novels. While very different from these previous works in some ways, Borne “sticks” because it emerges from and points to various directions at once. And this is both exhilarating and frightening. The compass needle spins wildly as we enter a new territory. Do I wake or dream? Am I hypnotized, or mad? Can I trust our leader? A distant shriek, barely animal. Saints preserve us. Reading and writing fold minds over time. Communication suggests—perhaps guarantees—another type of fold. Bare existence. And conversely, bare existence might guarantee communication. We gravitate toward dialogue, even internal dialogue, with a sense of purpose, while understanding (surely) that it never ends. We can close a chapter and a book, but we can’t outrun ghosts. And even those pages we will never read, leave a trace in cultural memory. Borne is a striking moment in the ongoing conversation about our futures. An unframed original, a sacrifice, and a gift. [i] Acclerationism is a popular socio-political concept expressing the hope and expectation that capitalism will accelerate beyond its capacity and suddenly collapse, bringing about radical change. [ii] Though the distinctions are not at all clear in any context, the term “transhuman” usually represents an anthropocentric, futuristic ideal of overcoming human limitations, while the “posthuman” denotes a more critical or value-neutral worldview, which calls the concept of humanity into question. [iii] I’ve borrowed this conceit from Deleuze’s The Fold: Leibniz and the Baroque. However, folding and unfolding as approach and withdrawal might also be considered in the context of Graham Harman’s 2011 The Quadruple Object. [iv] What kind of speciest would get so excited about animals being folded into humans in the first place? THE SEEDS OF THIS CONVERSATION were planted when I saw an online announcement for Timothy Morton’s new book, Dark Ecology. Immediately I felt the cover design resonated with the amazing covers of Jeff VanderMeer’s Southern Reach trilogy. When I mentioned this to Tim at an academic conference, he said it was a sort of lovely and weird coincidence because he and Jeff had recently started communicating with each other — appreciating each other’s work, ideas, and aesthetics. Soon after, Gerry Canavan and I started collaborating on “Global Weirding,” a special issue of the academic journal Paradoxa, and we agreed that Jeff and Tim would make an engaging and provocative pair to feature in conversation with each other. In many ways, they both have a magical ability to produce extremely edgy and sophisticated work capable of reaching wide audiences well beyond academic and/or genre fiction coteries. Fortunately, they agreed to meet via Skype one morning in the summer of 2016. I opened the conversation by asking them to start with a statement on what they found engaging and illuminating in the other’s work and how they envision their work intersecting, and then I quietly recorded and observed as their friendly, loopy conversation veered around through Beatrix Potter, Surrealism, childhood experiences with tidal pools, fur-shedding cats, and uncanny orange juice. TIM MORTON: There’s a very, very strong overall feeling about the work that you do, Jeff. There’s a very dreamlike quality to it, and I like this quality very much. If I was going to use a word to describe it, I’d probably use Freud’s word “displacement.” There’s something around the corner all the time. You can’t quite put your finger on it, and maybe you’ll never be able to put your finger on it. It’s sort of disturbing, tantalizing, dreamlike, and there’s this overall feeling of losing a sense of obvious reference point, whereby the way that you’re dreaming and what you’re dreaming about are sort of weirdly melded together so you can’t tell which is which a little bit. JEFF VANDERMEER: The interesting thing is I’m very much a writer who is both organic and mechanical. I believe in getting down a draft, which is very influenced by the subconscious, and then peering through it. After I wrote Annihilation, I started seeing reviews that mentioned your work in connection with it; that’s why I picked up Hyperobjects, and the thing that was fascinating to me is that it appealed to both the organic and the mechanical sides. The mechanical side made me understand what I had written better because the very term “hyperobject” kind of encapsulated what was going on organically in Annihilation. Then, partly because I’m not a philosopher, but also because I’m interested in this subject, the book sent me on another delightful “down the rabbit hole” moment. In part because there were sections where I had to bulwark basic knowledge before I could go forward. And then there are other things that I know are received by my conscious mind, but my subconscious is working on breaking them down and reinventing them for future fiction. I always go through this process in which I have to trust my subconscious first, and I then have to understand what it was that I did, and then my fiction is informed by all of that; your book really helped me with that, which is really important in this context where I’m fairly sure there isn’t going to be a novel I write going forward that doesn’t deal with ecological themes in some way.